The Golden Spoons: My Kryptonite Is . . . . . . I look in the mirror and see the dark circles under my eyes, the wrinkles that are forming, the extra pounds I can't seem to shed. The last two pairs of jeans I bought came from the "plus size" store. I hate what I see. "I wish I was pretty," I think to myself. "I wish I was as skinny as this person or as stylish as that person." As the sun's rays shine through, I see the fingerprints on the window and the crumbs on the floor. There are dishes piled in the sink and laundry in the dryer than needed to be folded yesterday. I don't have a designer's eye and my house doesn't look like anything in the Better Homes and Gardens magazine that is collecting dust on the coffee table. If I can't make it beautiful, I should at least keep it cleaner! There's plenty of time if I never sit down. I was only an okay mom today. I lost my cool when they were bickering incessantly in the car and yelled at them. I got frustrated with homework and laundry requests and whining about taking showers. Dinner came from a box and there were no fruits, or veggies, or anything organic on the paper plates I used to serve it. I didn't want to read bedtime stories or braid their hair. I was relieved when they finally went to bed. We should have soaked up the sunshine outside and shared more hugs, but we didn't. I didn't. I was a second rate wife today, too. My husband was literally across the country on a business trip and a three hour time difference is far more brutal than it might seem. By the time he was getting up, we were already out the door and getting on with our day. By the time he was free to talk on the phone, I was exhausted and ready for bed. I didn't text him any sweet little love notes and, truth be told, I was jealous and resentful. . He was having a nice dinner with actual adults and heading back to a quiet hotel room that somebody else cleans while I was knee deep in carpool lines, piano lessons, soccer practice, and homework, eating dinner from a box in this messy, in-need-of-renovations house. Tomorrow, he'll be on a plane heading somewhere else, but I'll still be here doing it all over again. I know he works hard to provide for our family and I truly am grateful, but somedays I forget to remember that. Exhausted and disheartened, my head hits the pillow. I close my eyes and replay the day in my mind. "You look nice today!" I hear a co-worker repeat. "Thanks, mom! You're the best!" I hear my children say and I remember that there are blessings amidst the mess. "I miss you and appreciate all that you do," I read in the text from my hubby. It is clear. 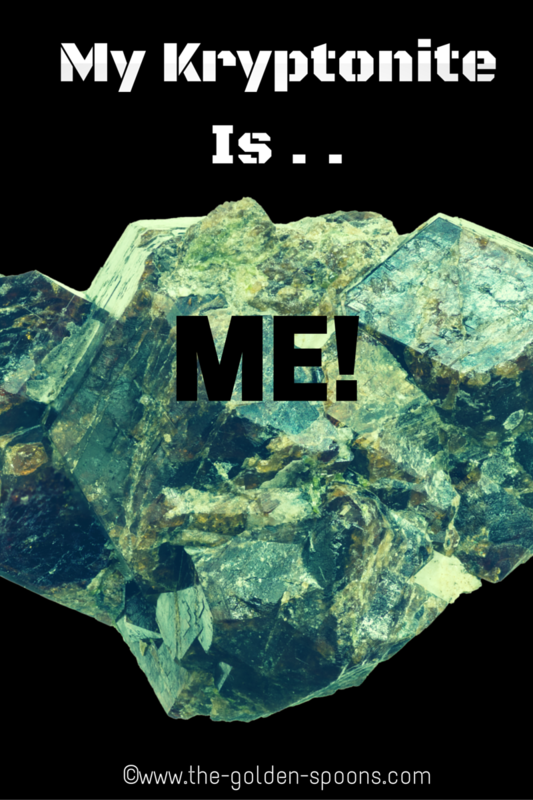 My kryptonite is . . . . ME! I am my own worst enemy and biggest critic. Maybe it was just another day - nothing out of the ordinary - but there were hugs, and smiles, and laughter. It wasn't gourmet, but my children were fed. Our house doesn't look like anything from a magazine, but it is sturdy and it keeps us sheltered together. Why is being "just enough" never enough? Why do we hold ourselves to some ridiculous, unattainable standard? Why do we expect ourselves to be super heroes when we would never expect that from anyone else? I have often said that I feel like a gerbil on a wheel - running and running, but never getting anywhere. I lose sight of the fact that just keeping the wheel spinning is a major accomplishment that takes stamina and fortitude. I forget to be grateful for all the blessings I have and I get bogged down in the day to day minutiae of it all. Do I cherish every single second with my children? No. Do I get jealous and communicate poorly with my husband? Yes. Do I sometimes close my eyes and wish I was anywhere but here? Sure. Is all that perfectly normal? YES!!!! YES!!! YES!!!! On the days when I'm drowning in motherhood and overwhelmed by the mundane day-to-day, feeling unimportant and insignificant, I have to be stronger than the kryptonite. I have to remember my blessings and embrace the beautiful, ordinary chaos of it all. I have to try to see myself through the eyes of the ones who love me. I am a Superwoman and I have to remember to wear my cape with gratefulness and pride. This post was written as part of the Finish The Sentence Friday Linkup hosted by Kristi of Finding Ninee, and this week, by me! This week's sentence was "My kryptonite is . . . . . "